The F1 cars of 2011 hit the track for the first time on Tuesday next week, at Valencia, with the Mercedes, like many cars, being launched that morning. It's very easy to forget in the passage of time that, winding back 12 months, the Merc squad were the centre of attention, and not just because they were a new team or (effectively) the defending world champion constructor. No, the attention was because Michael Schumacher, returning from a three-year 'retirement', was to be one of their pilots. Such talk now seems a million miles away given how the year panned out, but the return of the seven-time champion was the talk of last year's season previews. As an example, Motor Sport magazine, with the front cover headline 'Return of the King', commented in their preview that: 'The big news, of course, is that he is back...Double World Champion Fernando Alonso moves to Ferrari, the two most recent champions are paired at the same team and still Michael sweeps the headlines just by turning up again'. Furthermore, expectations (including mine) were high - how could they not be? Sure, he was 41, and had been away for three years, but we'd long since learned to write the guy off at your peril, such was his frightening competitiveness, supreme ability and aggression, and ability to overcome just about any obstacle in his way first time around. He always had and clearly continued to have super-human levels of fitness. Further, as Motor Sport outlined: 'In prospect it is a package that could, perhaps should, dominate: the mighty Michael, back in harness with the unassailable Ross Brawn, Mercedes cash and power, a tech team that (Honda-funded) produced last year's double-world-title-winning Brawn BGP001....Nico Rosberg, almost inevitably, will be expected to play wingman' (I don't quote this to criticise or embarrass Motor Sport, most others were talking the same way). However, in the history written of the 2010 season Schumi will be but a footnote. Yes, the Mercedes car was a disappointment, never on the pace of the Red Bull, Ferrari and McLaren, as the team dealt with the overhanging lack of 2011 car development from the under-funded and under-staffed Brawn team in 2010. 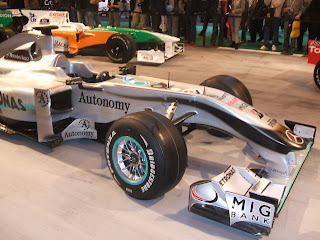 But even with that Schumi's performances were disappointing. The bald facts of his outputs compared to team-mate Nico Rosberg are well-documented: 72 points to Rosberg's 142, outqualified by 15 to 4. And while all of this was going he was often several tenths off Nico's pace and, before the final four rounds, rarely showed sustained progress. Some of his performances were frankly egregious. So, what went wrong? Schumi himself, and the Mercedes team, attributes it to current 'control' tyres and their associated understeer as not suiting his driving style. Others thought it may be age catching up with him, or us underestimating the true potential of Rosberg. Some even thought the unthinkable and saw his 2010 struggles as reason to reassess Schumi's ultimate potential as a driver from the 'first time around'. In truth, it may have been a combination of these things. To take each in turn, there is validity in the claim that the 2010 Mercedes and its Bridgestone tyres did not allow him to drive with his 'nailed on' front end car set-up that characterised his glory years at Ferrari and Benetton (and that many of his team mates found near undriveable). Subsequently he often looked at odds with his car, especially in slower corners. Autosport's Mark Hughes, who can spot these things, identified this in the first race weekend at Bahrain and wrote about it widely. However, such a point gives scant regard to the fact that a top-class driver should have the ability to adapt to his equipment. Indeed, in 2001, at the heights of Schumi dominance, Ross Brawn claimed that 'the biggest difference between Michael and the others is that, when the car isn't working well, he can get more out of it'. Indeed, Hughes pointed out that in his pomp Schumi had 'adapted brilliantly to understeering cars. He used to adapt his style corner by corner, lap by lap, to whatever was appropriate' (one also thinks of how Alonso completely changed his driving style upon leaving Renault for McLaren). Alain Prost concurs: 'Honestly, I think all this talk about tyres is just an excuse, because Schumacher always adapted to anything - it was his great strength'. This is also without mentioning that Rosberg, who has a similar distaste for understeer, clearly adapted more successfully to the car than Schumi did. If the 'tyres excuse' is to be believed then is is necessary that such adaptability must have left Michael. Prost instead believes Schumi's inability to perform as before is more explained by time catching up with him, as well as perhaps unreasonable expectations to begin with on how he would perform coming back: 'For me it's just a question of age. It's just not possible to return to the top at that age after being away for three years. It's a matter of physiology.' Age is not to be defied of course, and the desire to push for those final tenths of a seconds and to take risks will wane over time (James Hunt always insisted that the brain got tired with age long before the body did). Niki Lauda, who is often cited as an example of making a successful comeback to F1, was 32, not 41 when he returned. And in his case he often found himself seconds off team mate Prost's pace when they were team mates. So, perhaps with this in mind, Schumi's being but a few tenths per lap from Rosberg's pace may represent something of an achievement. Indeed, Prost goes further to say that Schumi's not 'managing expectations' for his return hasn't helped him: 'I think Schumacher showed a lack of humility before the season - saying he was coming back to try for another championship, and so on. He should have said he was coming back to help Rosberg or Mercedes - or his friend Ross Brawn - in his first year, and that would have made it easier for him.' Martin Brundle agrees that Schumacher 'set the bar too high for himself'. Still, it's difficult to see how the pressure Schumi put on himself made anything other than a marginal difference to his actual on-track performances. So, now to think the unthinkable: did Schumi's struggles last year suggest, at some level, that he wasn't all that to begin with? Well, it seems undeniable that at least part of his relative struggle was due to there being a much stronger range of contemporary F1 drivers in 2010 than was the case for the bulk of Schumi's 'first' career. With the exception of Mika Hakkinen, for the long and successful mid-part of Schumi's career he didn't have any drivers of the quality of Alonso, Vettel or Hamilton to content with, or for that matter Kubica, Button or Webber. Further, the 'aura' which used to surround him is long a thing of the past, the contrast of Timo Glock sticking his backmarker Virgin car up the inside of Schumi's at Melbourne with the way drivers would once upon a time virtually swerve off the track to let Schumi past could not have been more stark. Jackie Stewart agrees: 'To be perfectly honest, I never thought he (Schumacher) had the highest quality against him. Now he has. OK, he doesn't have the best car, but Nico's not doing a bad job with it, is he?' Stirling Moss has similarly commented of Schumacher that 'he's been overtaken...some of the hot-shoes today are exceptionally fast...I don't think he's got a hope in hell'. And while we're on the subject of contemporaries, there are those in the paddock who rate Nico Rosberg very highly. We should allow the possibility that we underestimate Rosberg's role in Schumi being overshadowed. Future years, wherein Rosberg will likely be compared against clearer yardsticks, should give us more clues on this point. We'll of course never know how a Schumi at his peak would have competed in this current era, but it's reasonably safe to say he wouldn't have dominated to anything like the same extent as he did a few years ago. So what of the future? It's true that in the last four rounds of the 2010 season Schumi did show some signs of getting to grips with the contemporary F1 cars, at least to achieve respectability. Mercedes, for his PR value if nothing else, presumably will hang on to him for as long as he wants to be there, at least in the absence of a Vettel or someone of similar quality becoming available. So he has time on his side. And the man himself still sounds determined, insisting that wins and possibly a championship push aren't out of the question this year. No one doubts that the fire still burns (the pitwall stunt at the Hungaroring showed that), and he has a legacy to protect. There will be new tyres, the Pirellis, which may suit him better. And who knows, if Mercedes produce a car capable of running at the front then Schumi can win again, and this isn't too unlikely given that they've got the genius that is Ross Brawn, Mercedes cash and have been concentrating on their 2011 car for longer than the teams ahead of them. But the problem is that Nico Rosberg would have access to those wheels as well. And there's the wider question that, even if he can still do it on occasion can Schumi, at 42, compete consistently against the likes of Hamilton, Vettel, Alonso and others over a 20-race championship fight? I'd guess that the answer is no.